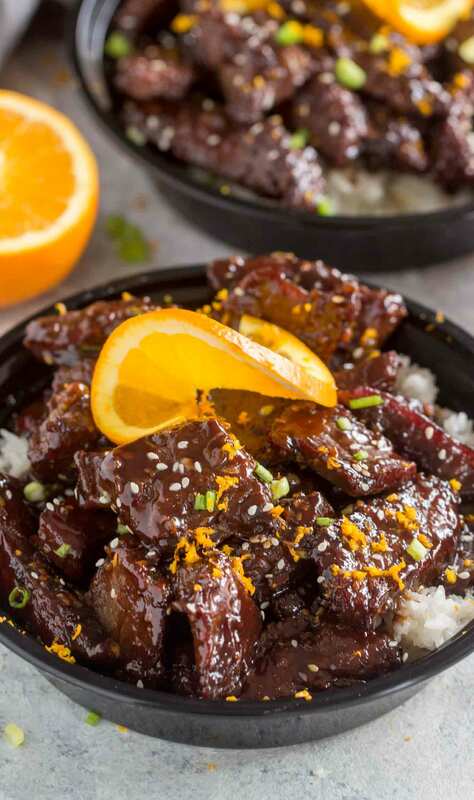 Sticky Orange Beef made in one pan in just 20 minutes, is full of flavor, made with fresh orange zest, orange juice, fresh ginger and brown sugar. 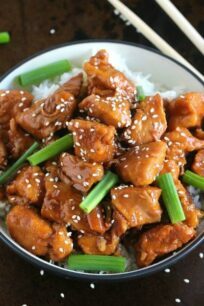 After making Instant Pot Orange Chicken, it became one of the most popular dish on the blog. 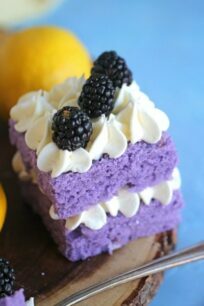 Since orange flavored dishes are in such demand, I decided to add few more recipes to the list. This Sticky Orange Beef will not disappoint. 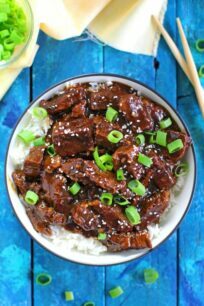 Sticky Orange Beef is one of my favorite quick and easy dinners. This meal comes together in 20 minutes and it tastes amazing. 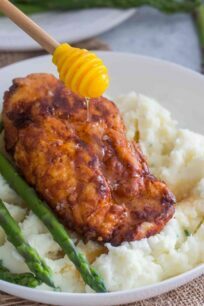 A delicious combination of sweet and savory, deliciously sticky and full of flavor that no one can resist. 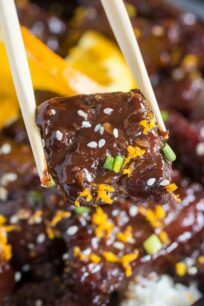 Also, the Sticky Orange Beef is bursting with fresh flavors like orange zest and freshly grated ginger. Brown sugar adds sweetness and a deep flavor, it also gives the beef the most amazing sticky coating, you will lick your fingers clean. Served over rice, the sticky sauce is fantastic. 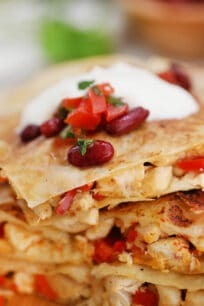 This meal is the perfect quick dinner and it makes for an yummy lunch that you can pack to-go. 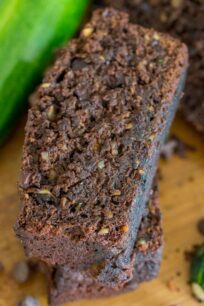 I like to use flank steak for this recipe, cut it into strips across the grain. Also, make sure you use high quality and fresh meat. In addition, use fresh orange zest and freshly grated ginger. It will add amazing flavor to the meal. You can use more or less garlic in this recipe, based on your preference. Similarly, for spicier kick, you can user more red pepper flakes. Also, if you don’t have sesame oil on hand, use canola or vegetable oil. 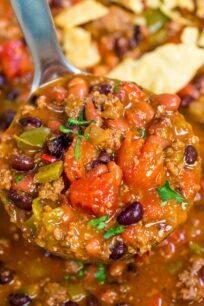 The brown sugar is amazing in this recipe. However, you can also use honey if you want to make it healthier. 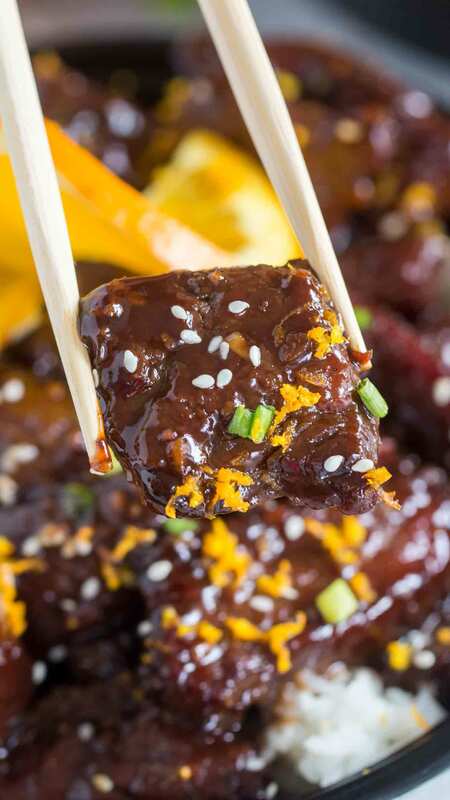 What is best to serve with Sticky Orange Beef? How to make Orange Zest? Then, set your tool over a cutting board. A microplane produces a very fine zest, perfect for baking and cooking. If you don’t have a microplane, use the smallest holes on an ordinary grater. Next, grate the skin of the orange only. Grate just enough to get through the orange skin, this way you can avoid the bitter white pith underneath. Rotate the orange and repeat. Once the white pith is exposed, rotate the orange and zest the next strip of peel. Repeat until most of the peel is removed, or until you have enough zest for your recipe. 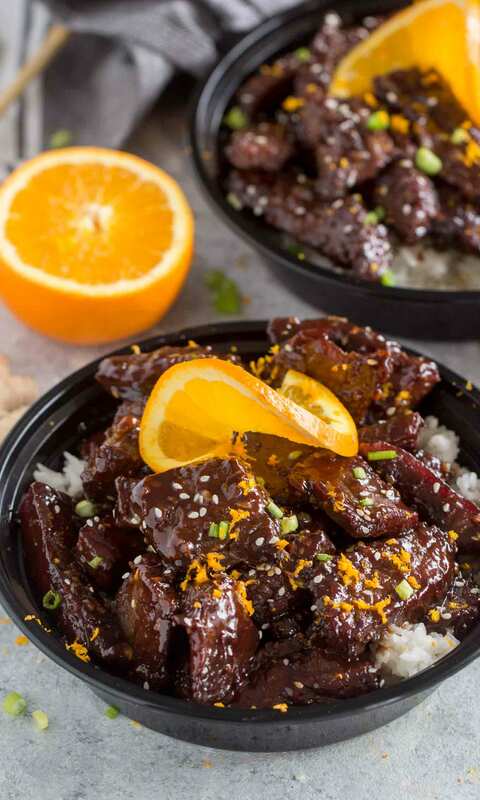 Sticky Orange Beef made in one pan, is full of flavor, made with fresh orange zest, orange juice, fresh ginger and brown sugar. Slice the flank steak into 2 inch chunks or into longer, thinner strips across the grain. In a medium bowl, whisk together: soy sauce, orange juice, orange zest, grated ginger, brown sugar, red pepper flakes and minced garlic. Whisk to combine and set aside. Add sesame oil to a medium cast iron pan over medium-high heat. Once the oil starts to simmer, add the sliced flank steak in one layer. Let it brown nicely for 1-2 minutes without turning it, after that, using tongs to turn beef on the other side to brown for another 2-3 minutes. 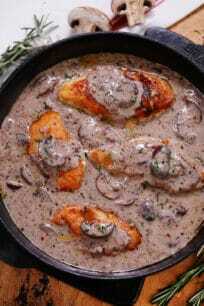 Reduce heat to low-medium and add the sauce to the pan. Stir to combine and let the sauce simmer on low heat for about 5 minutes until it reduces in about half and it creates a sticky glaze. Serve the beef over rice. Garnish with fresh orange zest, green onions and sesame seeds.